In the cemetery in Genoa a statue of Blessed Francis Mary of Camporosso may be seen which bears the following inscription: "Francis of Camporosso was born December 27, 1804, and died on September 17, 1866. This poor man in Christ was more blessed in giving than in receiving. With bread and advice and consolation, he was ever prepared to minister to the sufferings and needs of all who came to him. His austere and holy life he crowned with the sacrifice he made of himself at the beginning of the epidemic of 1866. The sorrow and gratitude of the people prompted them to immortalize his image in this marble statue." It needed but a few words to say all that one could wish to have said of this apostle of the people. As a shepherd in the little village of Camporosso near San Remo he was obliged to contribute to the support of his family. Later he joined the Capuchins at Genoa. There he clothed his ideals and intentions in the words: "I came to the convent to be its beast of burden." The opportunity was presented to Saint Francis Mary of Camporosso to carry out his intentions when he was made infirmarian, and especially when he was appointed to collect alms. He called at the palaces of the nobles, but oftener at the huts of the poor in order to distribute to them the alms he had just begged. He ventured to go into the ill-famed quarters of the seaport, where he would pick up the stones thrown at him and kiss them. He was a familiar figure in the dockyards, and eventually became well known as a saint. The people who labored there soon discovered that they could ask him for news of their friends and relatives who were far away and even overseas. Even though he had never met any of these people, his information always proved to be exactly correct. 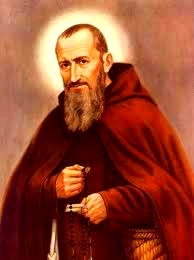 Soon it was reported of him from all sides that he was working miracles, cures, and conversions of a most unusual kind. People of rank as well as the lowliest souls came to him to seek advice. His love for our Blessed Lady was most touching. He spent entire nights on his knees before the Blessed Sacrament. When an epidemic broke out in 1866, he was seized with the desire to make his last and most magnanimous sacrifice. He knelt before the altar of the Immaculate Virgin, and through her hands offered himself to God as a victim of expiation. On September 17th, he departed this life as a victim. The epidemic ceased that very same day.